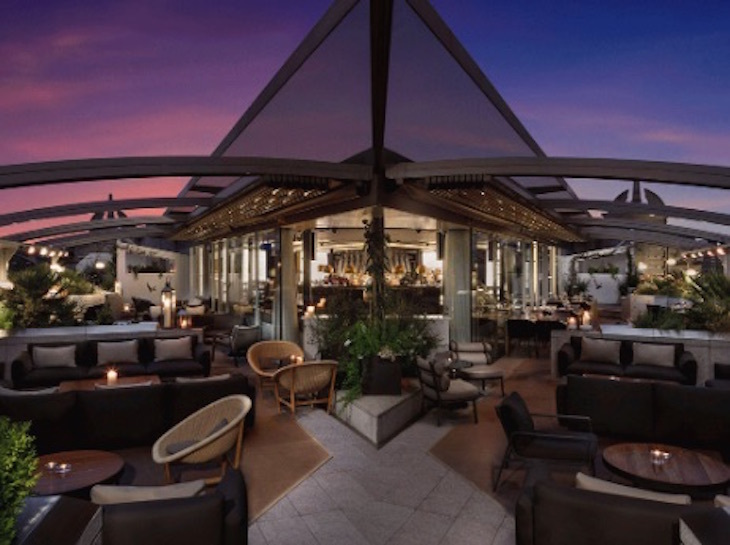 Us Londoners love a rooftop bar. From spring's first rays right through to summer's dying embers fading into autumn, we'll find any excuse to head up high for a pint or Aperol Spritz and enjoy the sun. Then, when winter rolls around, we chuck on a couple of extra layers, offer up a quick prayer to the gods of patios heaters, and do it all again, switching that Spritz for a mulled wine. 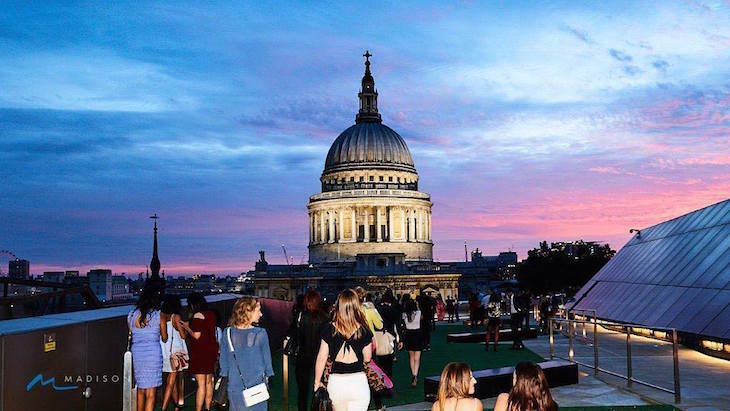 London's rooftop bars know that we love them, and they fully play up to it, serving up up a permanent rotation of menus, themes, and even igloos, dotted all across London's skyline. Here are a few of the best, whatever month it is. Marketing itself as a playground for adults, this east London party venue doesn't take itself too seriously. It might sit right on the edge of the Square Mile, but its heart and soul are firmly in Shoreditch — and thankfully, so are the drink prices. The rooftop has a makeover and a new theme every season, although the wigwam is a permanent fixture. In recent years, Moulin Rouge, Dr Strangelove and Valhalla themes have come and gone, each incarnation bringing with it a themed food and drink menu, Instagrammable decor and a full programme of events. If it's views you're after, Queen of Hoxton has limited eyeline, due to its position right next to the Broadgate towers. But, there's usually so much going on — think life drawing classes, drag bingo, hip hop karaoke — you barely notice. 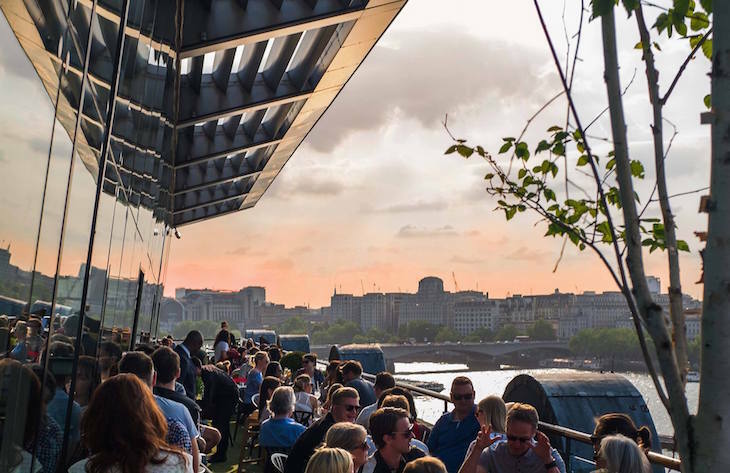 It's cheating slightly, calling the Oxo Tower venue a 'rooftop bar' as it's not strictly on the building's roof (how long until someone does open a venue on top of that famous tower though?). 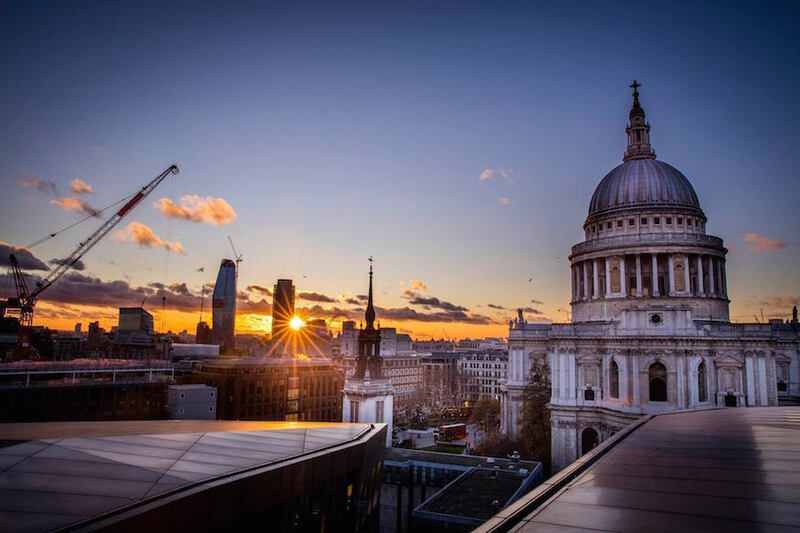 What it is, is a restaurant, bar and brasserie all in one, 10 floors above London, with a stunning terrace that offers views all the way along the river, and over towards St Paul's and beyond. Even in bad weather, the venue is a decent option for after work drinks or a pre-theatre meal — provided you've booked a table. But it comes into its own when the sun is shining, and those floor-to-ceiling glass doors are wedged open, given the entire venue the feeling of being outdoors. See eye to eye with Nelson (well, almost), high up on his column, at what must be London's most central rooftop bar. 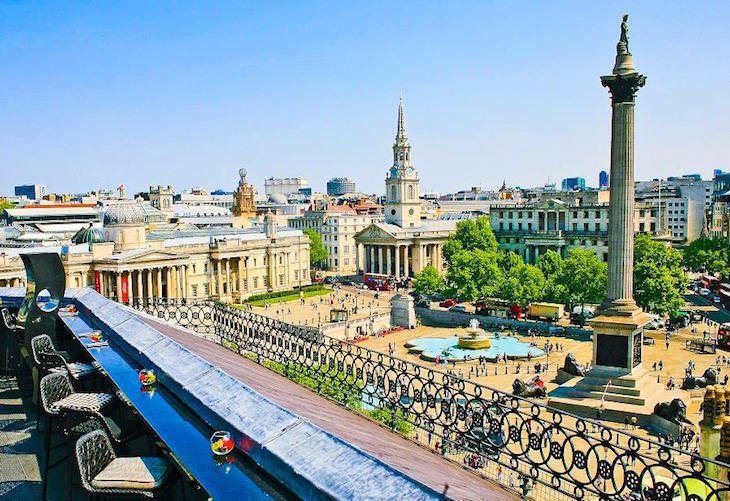 The Rooftop at The Trafalgar St James is open to non-residents of the hotel, although opening hours are restricted, particularly in winter, so do check before you go. It offers both covered and open-air seating areas, and we'd recommend braving the elements for the best view of the masses snapping selfies in Trafalgar Square below — fear not, blankets and heaters are provided in the chillier months. The menu includes classic and signature cocktails — with some warmer ones in the winter — plus spirits, wine, beer and an impressive tea list. Bar nibbles take the form of edamame beans, breads, baby ribs, chicken skewers and the like, although the menu is liable to change seasonally. We're all for being sociable, but can someone just reserve us a front row seat, hand us a bottle of wine and a plateful of snacks and leave us alone to people-watch for hours on end? Look east to the skyscrapers of the City, west to central London... or down for views straight into the courtyard of Somerset House. 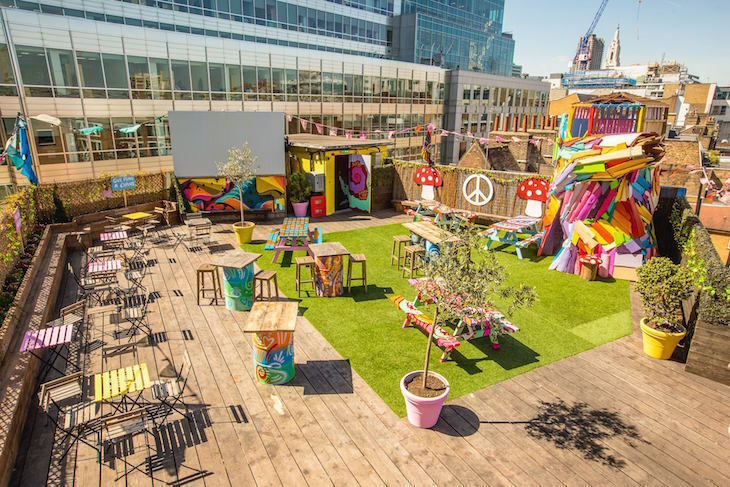 Radio Rooftop, above the ME London hotel, has undergone several transformations in recent years, but it's finally found its mojo as a rather hip year-round hangout. These days, food is as much of a priority as drinks are, with an impressive menu running through breakfast, brunch, afternoon tea and all-day dining. Dress code is 'smart and glamourous', and the drinks menu depends on what the current pop-up is — for winter 2018, Grey Goose Vodka cocktails were the speciality, served up in a Nordic-style winter hideaway. For the WOW factor, head up to Madison. It's located on the eighth floor, above One New Change shopping centre and offices, which doesn't sound all that romantic, but the views are impressive (it'd make for an epic first date venue). You're practically nose to nose with the dome of St Paul's Cathedral, meaning you're not just gazing out at the London skyline... you're in it. The vibe is a chilled out one, with comfy sofas and low tables that wouldn't look out of place in an Ibiza beach bar. The bar and seating area is covered, but the terrace area with the best views is open to the elements, making summer the optimum time to visit. Be warned though, in peak months, you'll be queueing even to get in the lift. Of course, you *could* come up here during the day and visit the roof terrace for free, but then you wouldn't have a cocktail in you hand, would you? Some people call it a banker's haunt. We call it the Bagpuss building, on account of its stripes. Either way, Coq d'Argent is a surprisingly large venue, the restaurant mainly tucked away inside, serving up contemporary French cuisine. Outside on the rooftop terrace, meals from the grill menu are served during lunch time, but in the evening, focus is firmly on spirits and cocktails, with bar snacks offered as a stomach-lining option. The space is a variety of covered and open-air, with various pop-ups throughout the year, including the annual winter Lodge d'Argent, dressed to look like a ski lodge with food and drinks to match. Heaters and blankets are plentiful, but Coq d'Argent's terrace really comes into its own in the summer, when those luscious (fake, we assume) green lawns give way to sunkissed views of the City skyline.